DIY woodworking projects – fun and useful at the same time. DIY woodworking projects and plans need to be flexible. At SketchList we often get questions about its applicability to diy woodworking projects. For example a woodworking products supplier wanted some help in setting up plans to sell to their customers. The advantage of the plan was it required no work to execute. However the disadvantage was the lack of inflexibility. Someone wrote into that company website saying they wanted to buy a bed frame if only it could be six inches longer. There son was tall! Now probably you could work out how to add 6″ to the length – but not everyone is as crafty as you! Flexibility and customization to meet needs – a big advantage of custom wood craft. The best solution, I told the executives, involves creating the plans in SketchList 3D and allow quick and easy modification. Their customers get what they want plus a cut list plus a sheet good layout. So diy woodworking projects and software. Can it be done? Here is what Healthy Handyman said after reviewing SketchList 3D for the DIY woodworker. Our users certainly agree with the article. A survey of SketchList 3D users revealed that 85% of them would recommend SketchList 3D to friends and family. This was for both professional and diy woodworking projects use. Healthy Handyman is a great site for tools and tip reviews. “Ranking products in our in-depth buying guides is not an easy job. We spend countless hours testing different products, reaching out to customers, researching and much more. We then rate each product based on dozens of factors. Among the most important factors are performance, price, warranty and real customer ratings. 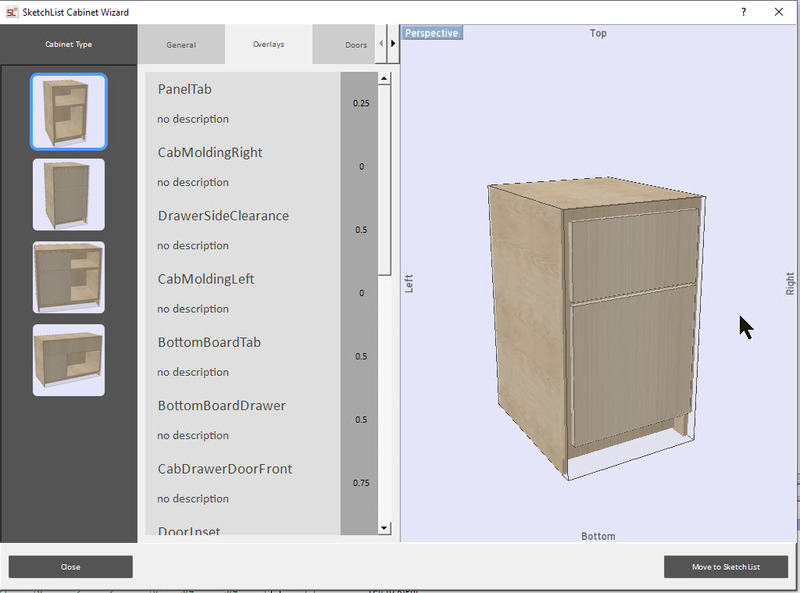 Next week begins our beta test of a SketchList 3D add-on that allows you select from a large number of project types [cabinets, tables, benches – the list will grow over time] and modify that as needed by filling information about how the piece is built and its relevant sizes and materials. Or you can accept the default values. One button click moves that assembly into SketchList 3D where cut lists, shop drawings, and even a sheet goods layout report are generated. This differs from using objects from the SketchList library in the amount of work required to make those first pieces. You can make that first cabinet in minutes – even if you’ve never used SketchList 3D before. Of course if you save these assemblies to the library – you can use them from there. Just like now. This functionality fills that gap between board by board design [a SketchList strong point] and inserting cabinets from our library. I don’t think it really replaces one or the other. Rather it augments the way the entire SketchList design process works. Since the start SketchList worked to bridge the gap between CAD and box based cabinet software. LINK for more. The add-on may appeal more to those looking for diy woodworking projects since they use the software on a less than day to day basis. The next project they take on requires little to no time to re-acquaint themselves with the software. Another way the add-on differs is you can make changes on more of a universal scope. For example if you want to change all sheet goods from 3/4″ to 5/8″ you just make that change once and it changes every 3/4 inch plywood to 5/8 inch plywood. More importantly this changes all the other parts affected by the change from 3/4′ to 5/8′ . This is a very early image of the add-on product. They say its user interface is one only a programmer or engineer would like. We’ll fix that – suggestions welcome. But it works wonderfully. It’s fast and flexible and, like all SketchList products, only improve with your feedback.